Kaveri Grameena Bank (KGB) has released interview result/ Final Result/ Final List of Selected candidates for the posts of Officers Scale I, II & III and Office Assistant (Multipurpose) for which interview was schedule on 27th January to 14th February 2015. 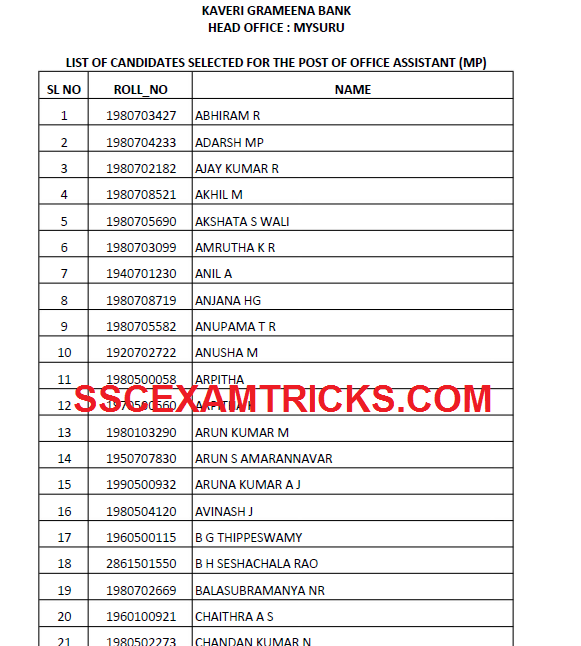 KGB has released the final result along with date of getting appointment letters and joining letter for these selected candidates for the 177 post of Officer in Middle Management Grade (Scale III), Officer in Middle Management Grade (Scale II), Officer in Junior Management (Scale I) Cadre and Office Assistant (Multipurpose). These selected candidates are required to follow the instruction of formalities i.e. getting appointment letter along with submission of required/ relevant document. KGB has released the schedule of completion of formalities roll number wise of the candidates on the official website. The selected candidates, who got appointments elsewhere / would not like to join us for various reasons may inform us in writing immediately, which will help us to provide the opportunity to wait listed candidates. We would like to clear wait list also by 31.03.2015. Candidates must adhere the schedule provided for completion of formalities of Bank on time. The reporting dates are released on the official website for Officer Scale I, II & III and Office Assistant (MP). The candidates who require additional time for joining the duty may write to KGB indicating the reasons and likely date of joining. Candidates who had obtained minimum cut-off marks (Score) in the IBPS Exam which was held in the month of September / October 2014 was sent interview call letters to their email. The cutoff marks were released category wise on the official website of KGB. The cut off marks for General/ OBC Category were 80 Marks, Scheduled Caste (SC) were 76 marks and Scheduled Tribe (ST) were 70 Marks. Based upon these cut off marks, three times more candidates was called for interview of the posts. The selection was based purely on Merit list which was obtained after interview of all candidates. The total marks of Interview were 30. Total weighted score was obtained on the basis of performance in CWE and Interview. The interview was held at the Mysore center. Formal introduction on bank & policies at NIRB, Bangalore for 6 days (4 batches, at banks cost). Selected candidates are advised to bring the following documents at the time of joining. Now Final Selected candidate will have to get appointment letter which will be issued by KGB. The date of Joining and reporting venue is mentioned on the appointment letter. Candidate must bring original documents along with a photocopy set of original documents such as 10th, 12th, Graduation, Degree or others along with domicile and caste certificate. Candidate should bring two passport size photographs at the time of getting appointment letter of Clerk Posts. Candidates are advised to bring at leave two coloured photograph, 2-5 blank A4 size paper sheet at the time of getting appointment letter/joining to the station (for writing joining application).